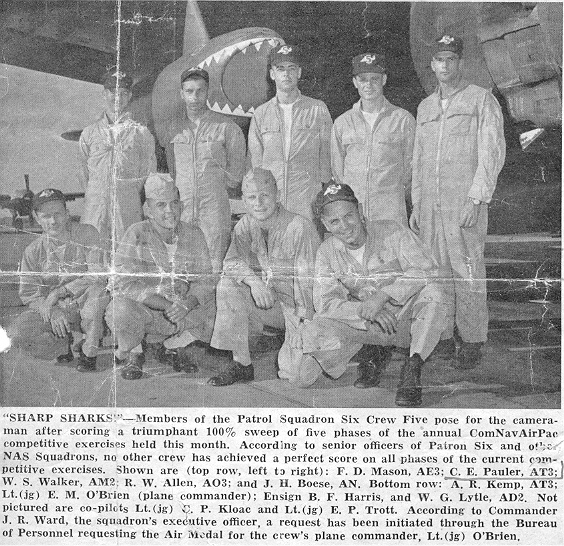 "SHARP SHARKS" - Members of the Patrol Squadron Six Crew Five pose for the cameraman after scoring a triumphant 100% sweep of five phases of the annual ComNavAirPac competitive exercises held this month. According to senior officers of Patron Six and other NAS Squadrons, No other crew has achieved a perfect score on all phases of the current competitive exercises. Shown are (top row, left to right): F. D. Mason, AE3; C. E. Pauler, AT3; W. S. Walker, AM2; R. W. Allen, AO3; and J. H. Boese, AN. Bottom row: A. R. Kemp, AT3; Lt.(jg) E. M. O'Brien (plane commander); Ensign B. F. Harris, and W. G. Lytle, AD2. Not pictured are co-pilots Lt.(jg) C. P. Kloac and Lt.(jg) E. P. Trott. According to Commander J. R. Ward, the squadron's executive officer, a request has been initiated through the Bureau of Personnel requesting the Air Medal for the crew's plane commander, Lt.(jg) O'Brien.